We Vermonters pride ourselves on being “green.” It’s a great attitude to have. However, we can do better. We have had recycling programs since the 80’s and most of us do pretty well at it. Recyclables are separated from trash for curbside pickups, and our solid waste districts are accepting more and diverse materials in their recycling streams. But the fact is that, despite a goal set in 1999 to achieve a 50% recycling rate by 2005, Vermont has over the last decade reached a plateau of about 36%. This means 64% of everything we throw away as a state goes to the landfill. This is a serious problem because we presently have only two operating lined landfills, one in Moretown and the other in Coventry; and the one in Moretown is estimated to have only about 18 months before it reaches capacity. So, the question is: how do we increase the recycling rate and reduce the amount of waste going to the landfills. Landfill waste can include not only things we think of as recyclables, like paper, plastic, aluminum, glass, and cardboard, but also yard waste, food scraps and other organics, which make up about 23% of the waste stream in the Chittenden Solid Waste District (CSWD). Decomposing organic matter also generates methane, a powerful greenhouse gas. My Committee, Natural Resources & Energy, is working on a bill, H.485, that addresses this problem. This bill sets a timeline for increasing the recycling rate of materials and diverting yard and organic waste from landfills. The first step is to require mandatory recycling of materials we normally associate with recycling. Some solid waste districts like CSWD and the Addison County SWD already encourage this through a “pay as you throw” system, which charges fees based on the amount of material going to the landfill. 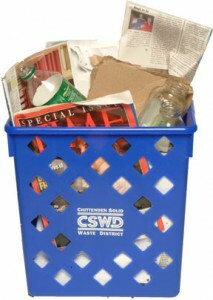 ACSWD’s recycling rate is currently around 50% as a result of this policy. The bill will require similar policies throughout the state. CSWD’s spokesperson, Jen Holliday, estimates that such policies can help us achieve 75% to 85% recovery of materials. The next step is to require waste haulers to pick up leaf and yard residual waste that is separated from other types of waste and deliver it to a facility for management of such material. This would assure that the material can be either composted or otherwise used for appropriate purposes. Examples of this type of material include grass clippings, kraft paper, brush, and other woody materials. The third step would be to require haulers to pick up “source separated organic material” and deliver it to composting facilities. This material includes food scraps, food processing residue and unrecyclable paper. This requirement would only apply to large producers of organic waste such as restaurants, hospitals, universities, grocery stores, etc. The amount is under discussion and ranges between 50 and 100 tons per year per producer. Composting this material would turn waste matter into valuable compost that can be used to enrich the soil. How valuable compost is can be seen by several commercial composting operations that have been started in Vermont, including Highfields Composting in Hardwick and Green Mountain Compost, which is run by CSWD. Other ways of diverting organic waste have also been identified, such as sending grocery products that have exceeded shelf life but are still usable to food shelf facilities. Vermont can and must be more efficient with reducing, reusing and recycling our unwanted material.